2019 Optional Theme: "Is There Anybody There?" "Our poets are encouraged to take inspiration from wherever they may find it, however if they are looking for some direction, competition participants are invited to use this year's optional theme to inspire their entries." 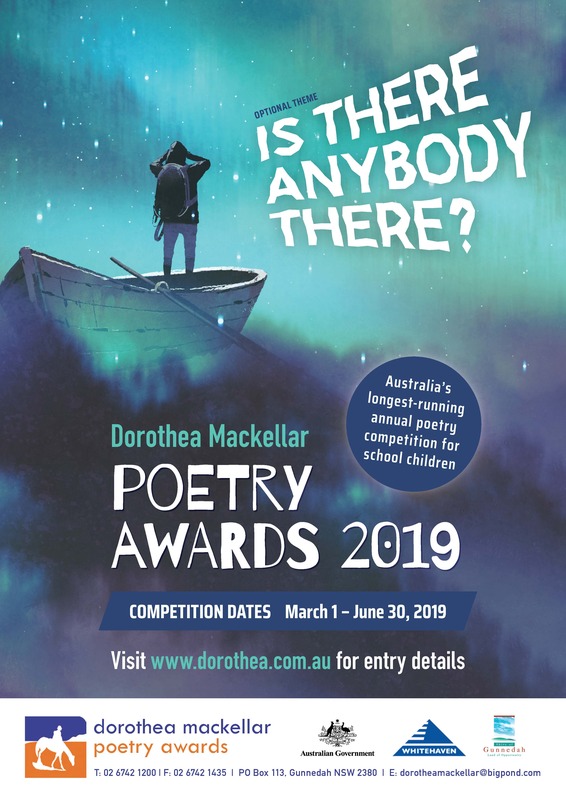 In 2019, the Dorothea Mackellar Memorial Society has chosen a line from the poem, "The Listeners," by Walter De La Mare (1873-1956.) Walter was a famous British poet, novelist and short story writer. He wrote whimsical, fantastical worlds for children and adults alike, and described children as "visionaries." Given this opinion, it is very fitting that his work be selected for this particular competition and we encourage you to use your imagination like he did! For a copy of the poem, please click here. And for a copy of the wonderful theme poster, please click here. Please consider online entry to help us save time and reduce humanity's environmental footprint. Print out and complete entry form for/by each student. Entry form available here. Mailed entries are individually scanned and submitted online by the Awards’ organisers. Please consider online entry to help us save valuable time during this hectic period and reduce our environmental footprint. We can all make a difference. Have a read of the judges' reports from the previous year. They contain some very helpful advice for teachers and parents alike! It is recommended for schools to appoint a coordinator for the competition. Only a teacher/parent can complete the registration form on behalf of the student/child. Log-in details: username is the email address and a password of your choice. Log-in details can be given to other teachers/students for poem submission in class/at home. Log-in as many times as necessary during the competition period. Teachers can view progress by monitoring the number and content of entries. Individual entries are accepted if the school is not participating or a child is home schooled. Parent needs to complete the registration form with their contact details. Please indicate 'individual entry' under school name and home postal address under school address. Invoice for the entry fee will be sent to the registered email address within 2 weeks. ‘Participation certificate only’ option available for schools where pre-selection of entries has been carried out. Poems under this option will not be sent to judges, students will still receive participation certificate for their efforts. Please read the Conditions of Entry before entering. Entries accepted: March 1 to June 30, results announced during early September. Check out our learning resources or browse the previous years’ themes and winning entries.